Virginia started training horses in 1975. Since 1983, through her national-caliber training facility, Chesapeake Training Center, Ltd located in Rocky Mount, NC, her devotion to the Arabian breed has cultivated a population of horse enthusiast for thirty years. Virginia takes pride in her dedication to the amateur and youth rider assuring her training program maintains a strong amateur presence in the show ring. 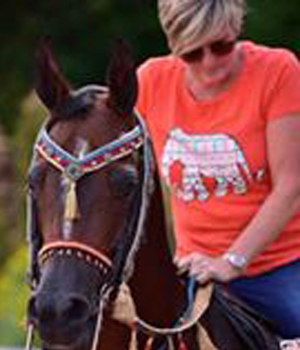 Her training and instruction is individualized for each horse and rider depending on the needs of each combination. Virginia’s approach not only utilizes conventional methods, but also capitalizes on her knowledge of natural horse behavior and instinct to create a willingness of the horse to learn and grow. She states, “What I enjoy the most about training horses is what I learn from them, what they tell me about myself and the other people that ride them. They expose your true self and intentions. Horses carry a mystery about them that creates an eternal intrigue.” Since 1983, Virginia and her clients have one numerous International, National and Regional titles in open and amateur English, Hunter, Driving, Western, Sport Horse and Dressage. In addition to these accomplishments, she was named APAHA Horsewoman of the Year and has become an AHA and USEF recognized judge. In conjunction with her training, showing and judging she also travels throughout the United States conducting clinics.